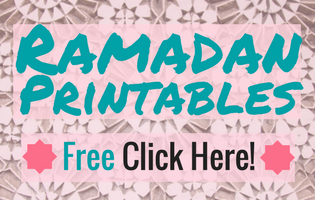 Calling Homemakers and busy Moms. Learn about fresh and clever ideas in this epic Evernote guide. Get your whole family life organized using Evernote. 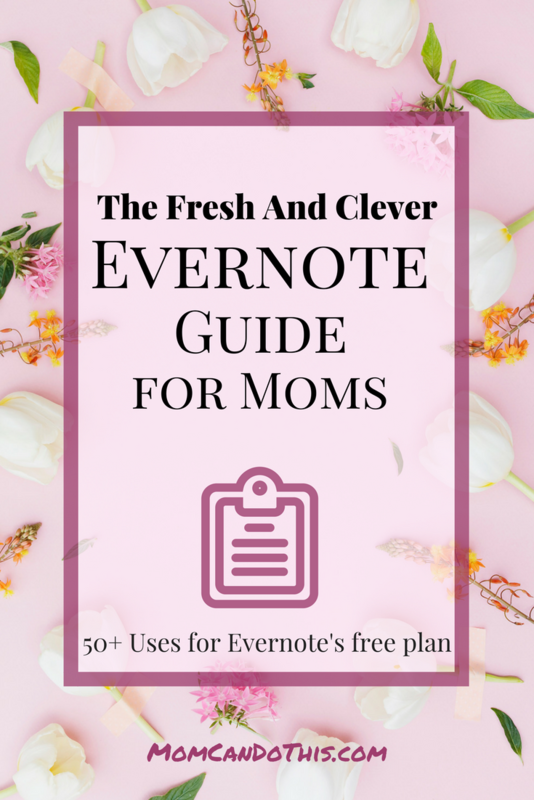 Download the free Evernote for Moms Guide with 50+ fresh ideas to streamline mom life. Mom life can be busy, packed with responsibilities, ever-growing to-do-lists and high expectations from everyone around you! Put in some dreams you might want to pursue or much-needed breaks from all the noise and what you get is the everyday overwhelm that all moms feel at times. You feel trapped in a mind-dulling grind of mundane tasks. And yet, you want to be the mom with the organized home, and happy children, working to pursue a dream, planning that awesome vacation, and never forgetting a birthday or mother’s day. You can be. If you get handy tools to help you load off some of your burden you can make mom life so much easier. 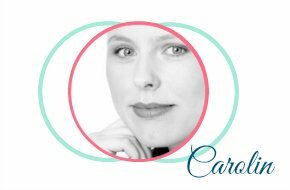 Let me tell you that I have found a free tool that helps me get my entire life more organized. It is called Evernote. No worries, you can do all of what’s coming with Evernote’s free plan. Oh, no! Yet another Evernote guide?! Wait, this one is just for you, busy mom! Let’s go through fresh ideas about how you can use Evernote to make your life as a mom, homemaker, business owner, creative, wife, … more organized. 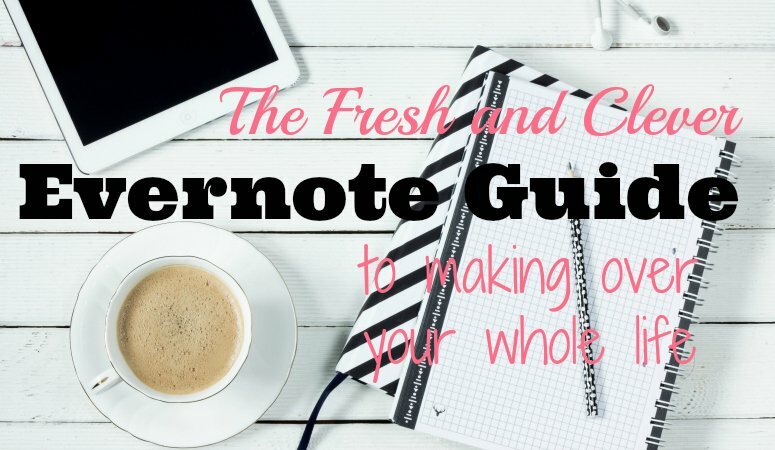 An Evernote Guide especially for homemaker and Work-at-home-moms. And that’s for free because you can do all of this with a free basic Evernote plan that I am using, too. I only wish I had discovered earlier what Evernote can do for me. Years ago a friend introduced me to Evernote but it wasn’t until I saw a youtube video explaining how to use Evernote to organize recipes that I thought why the heck am I not using Evernote more?? I had signed up and all that was there was an outdated to-do-list. And why, oh why, didn’t I use Evernote before my fatal hard drive crash?? Now, I understand how I can make Evernote work for me and I came up with 50+ ways to organize and streamline things using Evernote. I ended up with an epic Evernote Guide for all homemakers and moms looking for ways to get more organized. Free and easy that is! 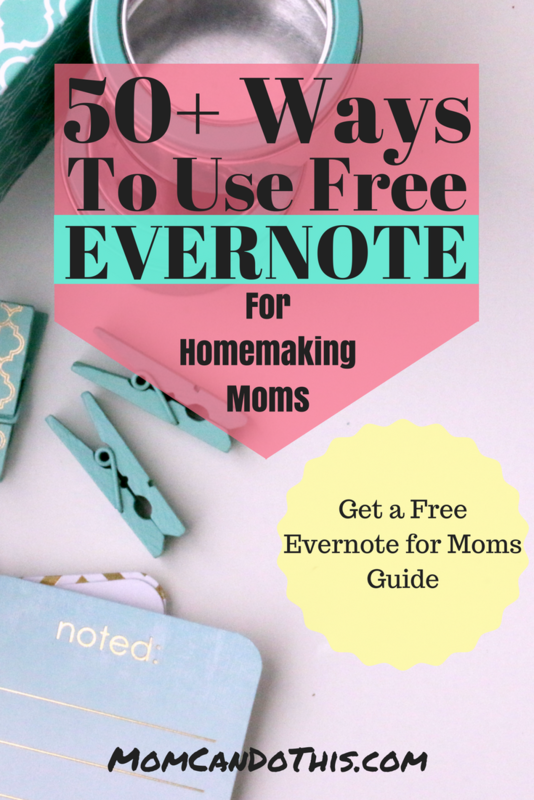 If you sign up at the end of the post you will get this Evernote for Homemaking Moms Guide for free. Until then, I will introduce you to my favorite features and uses for Evernote. But first, you might want to do a goal purge and focus on those goals that really matter! I put Evernote on my phone so I could use it all the time, anywhere, and sent photos from my phone right there. That’s when things got exciting. Now Evernote is my family organization system that allows me to share things with family members, too. It syncs automatically and I can quickly access Evernote with my phone or use it on the PC when working at the desk. So, if you haven’t already, go to www.evernote.com and sign up for the free basic account. Get the Evernote app on your cell phone (Android or iPhone). I use this phone app and the online version of Evernote. In addition to that, I have the web clipper browser extension. If you are worried about sensitive data that anyone can access who grabs your phone in an unattended moment I hear you! Lock your Evernote space with a passcode. This has been a premium feature but is now included in the free plan as well. When I got started with Evernote I have been using notebooks a lot because this is what I was used to from Windows. But oftentimes, I could not really decide where to put a note. 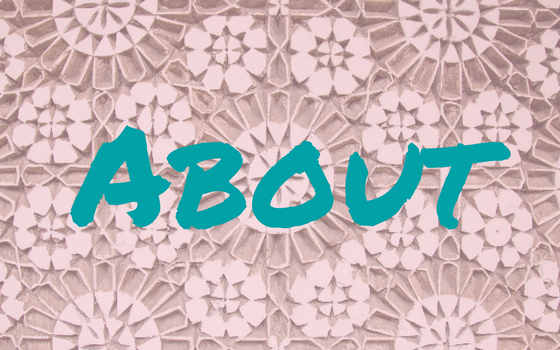 Work from home or blogging? Moroccan recipes or recipes to try? I then started to use more tags. That way I can easily use all the tags I want without producing duplicate content that crams my Evernote account. And I can easily find things without going through several notebooks. Don’t worry. If you do not find something you can use the search box of your Evernote. Not only that: Evernote can search text on images, even hand-written ones! Another bonus: Free templates that come for different purposes. I mention those I use in the guide and link to them. But you can also create your own or search online for a template that matches your needs. 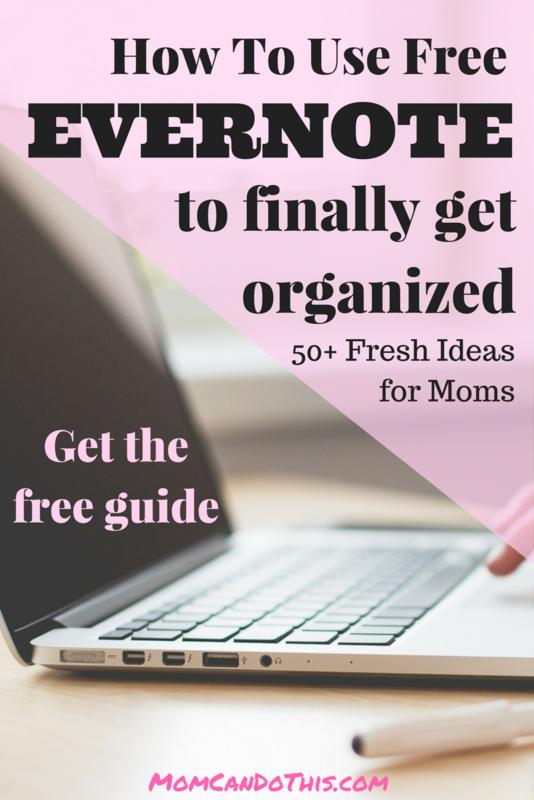 So, what is it that you can do with Evernote that makes mom life easier and more organized? 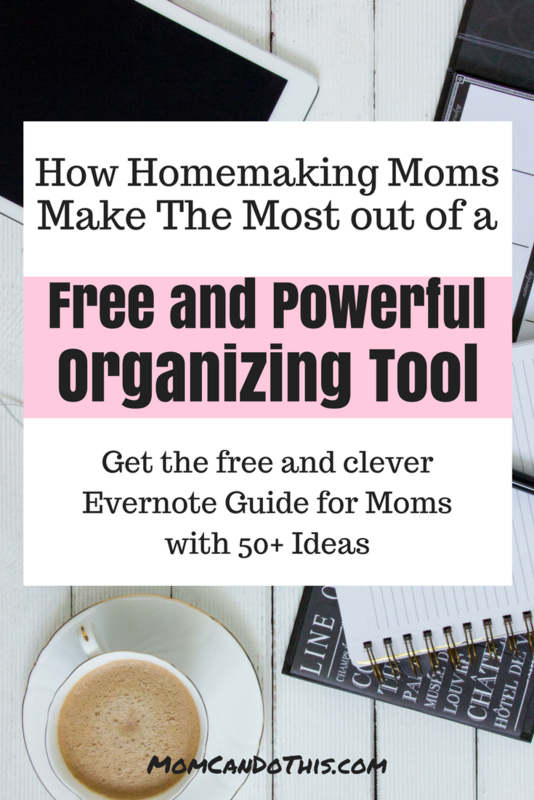 Don’t forget to sign up at the end of the post to get the full free Guide on more than 50 ways to use Evernote as a powerful organizing tool for homemaking moms. Medical Records for all family members. Sometimes when I get back a medical test I take a photo of the results and keep them in Evernote. Also, my little one’s documents and some of my husband’s records are there. If I want a quick reference or if I’m asked when was this done or when was the last time… I can look it up. Create a local folder for sensitive information. Create a “local notebook” in your desktop Evernote that doesn’t sync. It is only accessible on your local computer. But keep in mind that you cannot go back and change that notebook type later to one that does sync. Meal planner and shopping list. Evernote is great for meal planning because you can create a shopping or stockpiling list there, too, and you have your plan and list with you. Store digital manuals so you don’t have to keep hard copies. I love this one! Whenever we get some new electronic gadget I try to find the manual online in pdf format. Sometimes a pdf manual even comes right with the product on CD. I collect them in Evernote so I can get rid of paper that would eventually clutter my home. Brain and idea dump. Also, I don’t need to write so many memos on paper because I have a brain dump note in Evernote. I can take notes there directly. No paper and pen needed. Budgeting and Cashflow calculation. This is the one file I use the most. I keep track of all payments and bank balance. I note what is due when and delete what has been paid. Also, I put in a note what we spent in a month for each budget category. Keep track of expenses. Track expenses in a household budget book as described in this post. You can note all your expenses for your business or other fields and add photos of receipts. There is a free Evernote Expense tracker template you can use. … gratitude journal, too. Note one thing each day! Use it for the 30-Days of Gratitude-Challenge for example. Draft blog posts and go through publishing checklists. At the same time. Read this helpful post about how bloggers can use Evernote by Michael Hyatt. Collect clients’/readers’ questions or suggestions. Put them in Evernote to have them in one place and to easily access them if you need inspiration for your biz’. Save yourself time and nerves by putting them there anytime you get one. That way you won’t have to sift through emails, comments, and messages later. Please read my guide on how to rock working at home when you just get started if you want to make the most of your working hours. Store web articles to read. Use the Evernote web clipper browser extension, tag the article as “read later” and actually read them later when you sit in a waiting room, in the carpool, etc. Don’t waste your time with customer magazines and such. Highlights of kindle books. Learn how to get your kindle highlights into Evernote, written by Michael Hyatt. Collect quotes or key messages of the books you have read. And find them easily for later reference. Travel packing list. We go to Morocco each year and I perfectly know what to take. But for my little one, I have created a packing list. I work on it and delete what has proven to be unnecessary or is outdated. Please, click over to this post if you want my best travel hacks for flying with little ones! Find a free plan travel packing list for flying with a toddler in the free resource library for subscribers. Create IFTTT recipes with Evernote. Use the “If this then that-App” for Evernote to create or use recipes that work for you using Evernote. This way you can automate processes and save important info and share things automatically. Ready for some more productivity? Learn how two magic words can make you a productivity hero. Collect information for a meeting. If you have meetings to attend collect what you need to bring or keep in mind in Evernote. Also, note questions to ask at the doctors, an appointment at school, etc. These were my favorite uses for Evernote as a homemaking mom to get family life organized. How do you use Evernote? Get the full guide with More than 50 fresh ideas of how to use Evernote as a homemaking mom now in the insider-only resource library. Become an insider of Mom Can Do This by signing up. 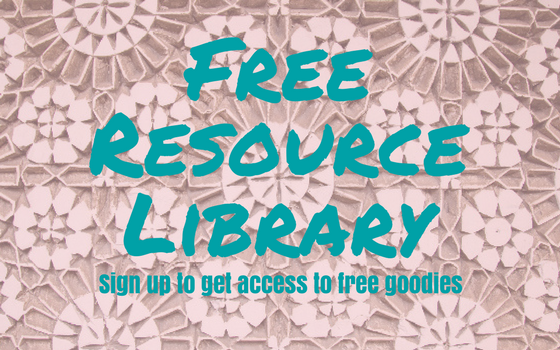 You will get a weekly-ish email and access to Mom’s insider-only library. Grab your copy to make the most of your free Evernote account now! My gosh! This guide is incredible. My husband has been touting the value of Evernote forever, and he can’t understand why I haven’t jumped on board. This post explains so much and gives my so many ideas for use. This is so much information – thank you for writing it! (I’ve bookmarked it as well as added it to a Pinterest board. Thank you! I’m so glad you found this helpful.